If the cement between the bricks is starting to wear, this can allow water ingress and damage to the bricks. 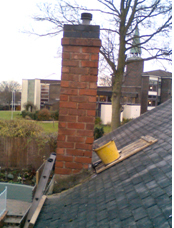 When pointed up with new mortar this problem is solved and the chimney stack is strengthened. This refers to the cement capping on the top of the chimney stack, normally used to secure the chimney pots and provide a waterproofing to the bricks below. If this is wearing or worn away, it can allow water to soak in and damage the chimney or leave the pot wobbly. 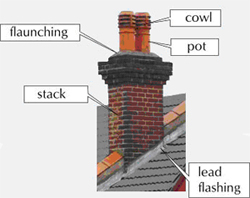 A typical example of a domestic chimney and correct terminology. These are fitted to the top of chimney pots, often to stop rain or birds going down the chimney. If the chimney is in use by a gas appliance, the cowl has to be carefully chosen to allow the dangerous carbon monoxide gas to escape at the correct flow rate. Often a cause of leaks into bedrooms and loft spaces, lead can wear through or become detached from its fixings between the bricks. Sometimes when the chimney is no longer in use, it maybe desirable to remove it entirely, especially if the brickwork has been taken out below. Exactly as it sounds, either the re-opening of a chimney flue, or the removal and capping-off of a defunct pot. We also offer a capping process that blocks off the opening of the pot, stopping access to birds and water but is totally reversible to allow full use of the chimney at a later date. Below: Genuine examples of our work, the removal of a defunct stack. 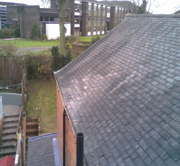 After the dust is washed off by rain the matching re-claimed slates will blend totally, rendering an invisible repair. 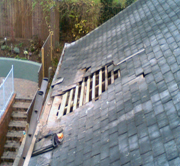 We always give an honest evaluation of any work that may be needed to your roof.